Johns Romero and Carmack played Rise of the Triad into the grave like two dudes on the same side of an air hockey table. People still love it, though. Sure, it's limited to 90 degree walls, but it's so delightfully arcade with the coins and jump pads and bodies exploding into ludicrous gibs... 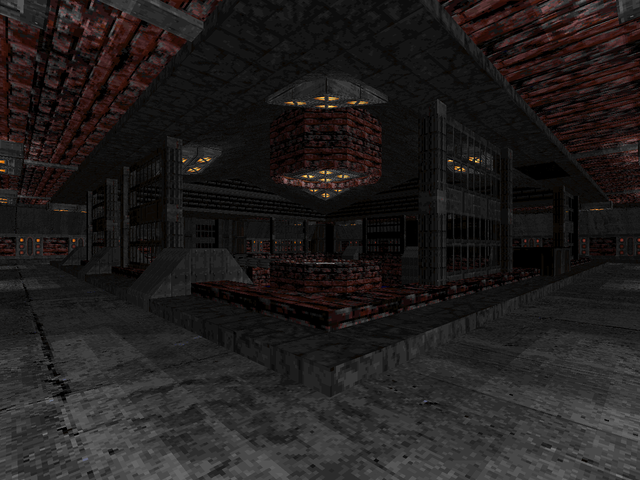 I'm sure some people wondered what RoTT would have looked like using Doom's engine. Well, through the miracle of science, Leon "El Zee" Zawada and Simon "5hfifty" Rance arranged such a thing! Actually, let's not kid ourselves. 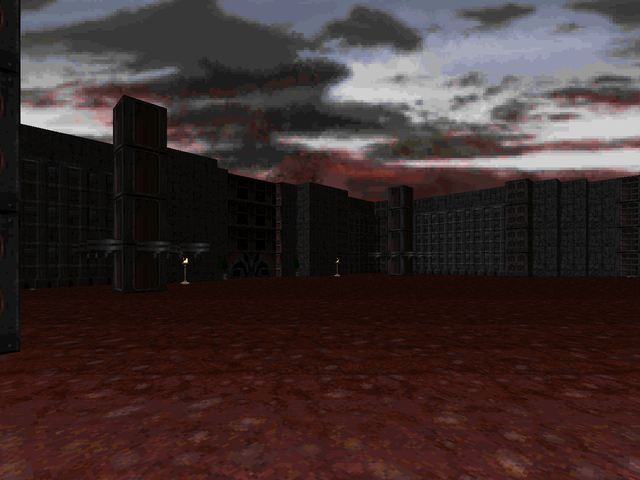 Return of the Triad isn't the Doom engine circa '93; it's the ZDoom engine as of '11. But WOW does it look so good. The story is pretty simple; H.U.N.T. discovers a Triad base (Episode One) that is merely an outpost of a much revived organization, dealt with in Episode Two. Chances are if you're reading this, you're familiar with Rise of the Triad. If not, here are some basics. You get infinite bullets for three weapons, though once you get the submachine gun you won't be using anything else. You also get a slew of highly explosive armaments with limited ammunition. 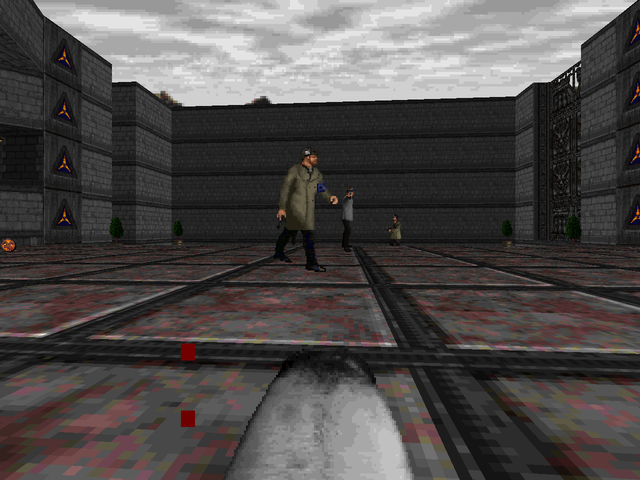 There are powerups, God mode and Dog mode, which make you invincible and pretty potent. And a whole slew of evil Triad members to blast into chunky kibbles exhibiting a broad variety of specialties. You can also destroy pretty much every decoration you find and pushwall secrets are back in, making great use of polyobject code. For veterans, here's what's changed besides level geometry. You are expected to jump in Return of the Triad. I don't think it's strictly necessary to in order to beat the game, but there are plenty of goodies you can only get to by vaulting. Also, that thing where you could only carry one limited ammo weapon at a time? That's out. Every armament from the bazooka to the Excalibat can be accessed from key 4 to 0. Don't worry; Return is balanced around this fact. I also assume it's balanced for the biggest gameplay change. Since there are no lives in Return of the Triad, collecting monk coins has to give you something. When you hit 100, you get a free God mode. It seems like overkill in the earlier levels, but when you start hitting the later areas, you'll be thankful. The rest, including end of level bonuses and Priest Porridge Hot, remain intact. So; these levels look gorgeous. They still feel very much like RoTT (2.0) just by featuring wide open rooms and corridors, but the detailing is superb with great use of slopes to add a softer edge and plenty of floor decorations. There's not a lot to get hung up on, so enjoy your playing field. The gravitational anomaly discs feature in many levels, creating different levels of play, at least three in one specific case. I feel safe in saying that El Zee knows his stuff. If you want to get a firsthand look at how different Return is from its source material, you're in luck! 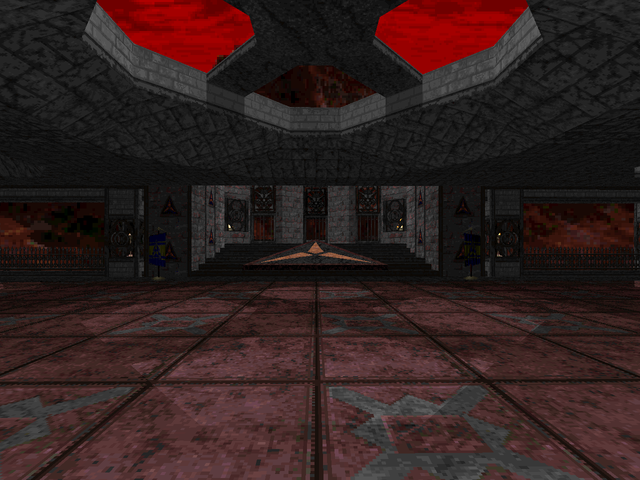 Zee recreated the first and eighth maps of the shareware episode as secret maps in his campaign. They hold up pretty good, but I really like what El Zee's done. 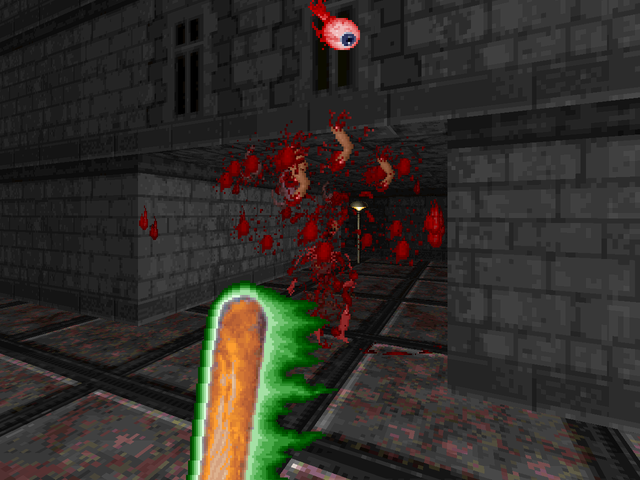 I don't really consider RoTT to have the most interesting bestiary. The enemies all have unique behavior, but Doom's collection is so much more colorful and varied. Both of Return's episodes only start to get engaging in the second half, where robots (for the first, only, interestingly) and monks / enforcers (for the second) start showing up. Up until then you'll get to paint the walls, and blowing the Triad is fun enough, even more so with the random God modes. If Return of the Triad had a subtitle, it would be The Wrath of God. I'd say it trivializes some encounters, but when the alternative is grinding away at toughs with MP40 fire, I'll take the Hand. 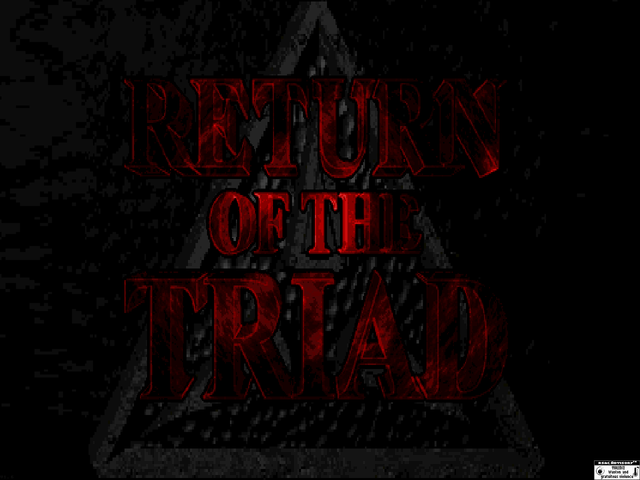 If you wanted to try out RoTT but the Wolfenstein geometry turned you off, Return of the Triad is the mod for you. I'd also recommend it if you're just looking for some different gameplay but in a classical flavor. Actually, it's just a really good mapset, just with RoTT mechanics. Unless you despise this series, it's worth a play. Some notes: Early releases had a fairly ubiquitous crash bug that has since been fixed. 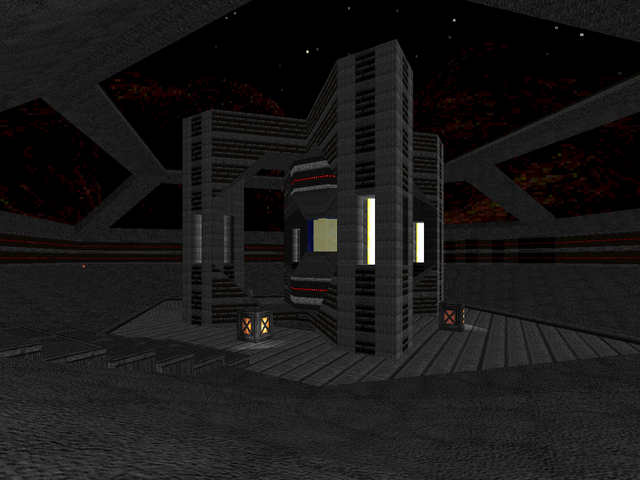 Episode One consists of Return's demo package, a standalone minisode of two maps. Episode Two is the main game, featuring a seven map main campaign with two secrets and a credits level you should really stick around for. Don't mash that spacebar...until you get to the cast call. Large level that reintroduces you to the basics. Some things are very different but I like this new look for RoTT. The architecture still has that wide-open feeling but still visually interesting with lots of Triad detailing. 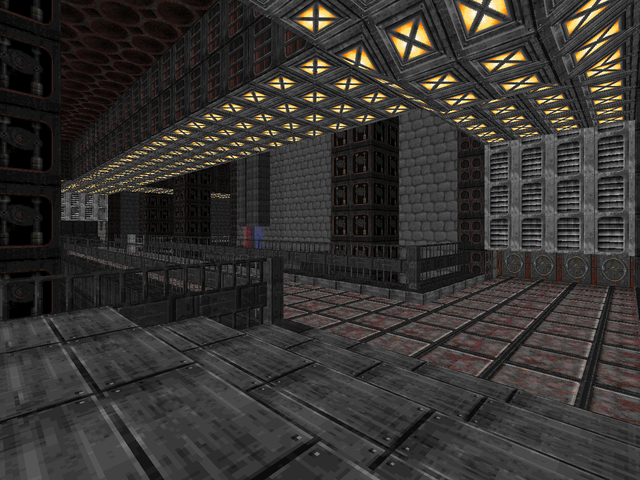 I particularly liked the cistern area to the northwest and even that opening room which just screams "Triad 2.0". Of course, given that it's RoTT, none of the fights here are all that distinctive, though throwing a bot in the silver key room was a great way to make things interesting. Larger than "Hidden Base" and a little trickier. There are some areas that really help sell the fact that it's a robot factory, like the open crate near the exit or that nightmarish conveyor belt sequence through all the crushers, or that machinery in the main hallway. Though the fighting is essentially as distinguishable as in the previous map, there are a few encounters that stand out in my mind, the first of which is the key fight right after getting off the elevator, quite a surprise. 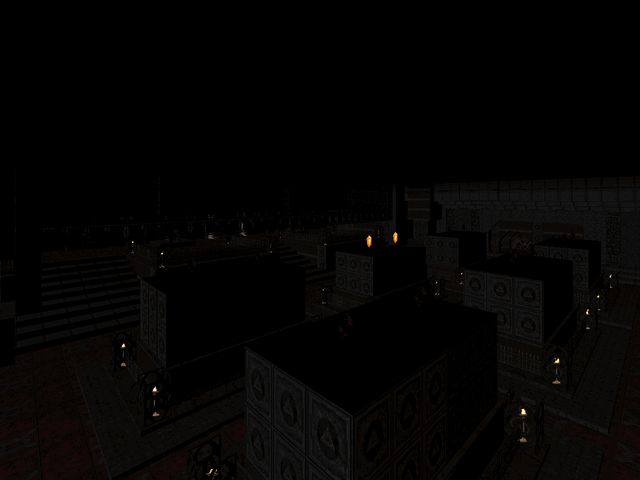 The crate room is pretty dangerous, too, but the centerpiece of the map is the reactor fight, which involves pumping rockets into the various bits of the generator, with waves of guards spawning in when you bring one down. Very cool. Nice long opener with plenty of enemies to blow apart. You'll have to work a bit for the machine gun, but on the way you'll see cool stuff like the fortress facade and main hall. Standout areas include the northwestern wing which houses a dog mode powerup and the fireball gauntlet to the northeast. There's even an elevator that takes the player from one part of the map to another. Standout moment is probably the poison gas trap, though you may have to do it over a few times depending on how quick you are navigating the maze (and finding the mask). A painstaking recreation of the first level of Rise of the Triad's shareware episode down to the timed door (though it opens at 1 minute in). It's a cute reminder of what the TC is based on and also serves to highlight the differences in architecture between the two. If you haven't played the original, it's a great map for RoTT, showcasing many of the game's features from jump pads to mode powerups to moving wall hazards and other wonderful things. 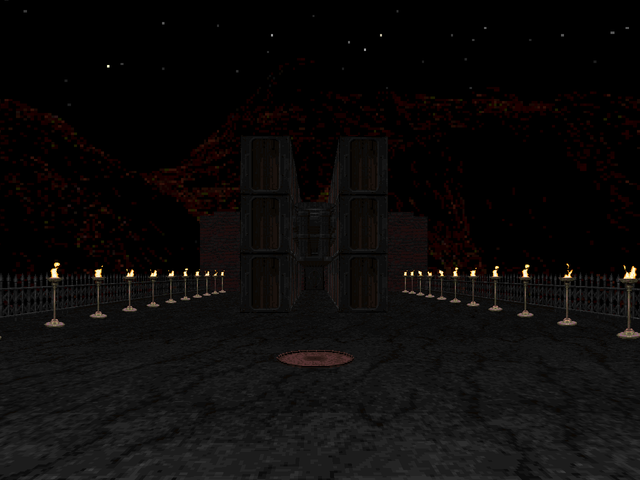 A painstaking recreation of the normal secret level of Rise of the Triad's shareware episode. 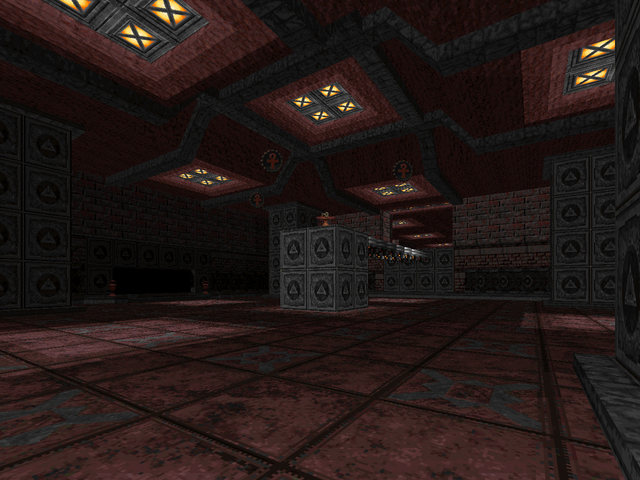 It showcases RoTT's moving walls (or more accurately ZDoom's polyobject code). It's got less aesthetic appeal, but the emphasis on changing level geometry makes it another fine example of the original game. 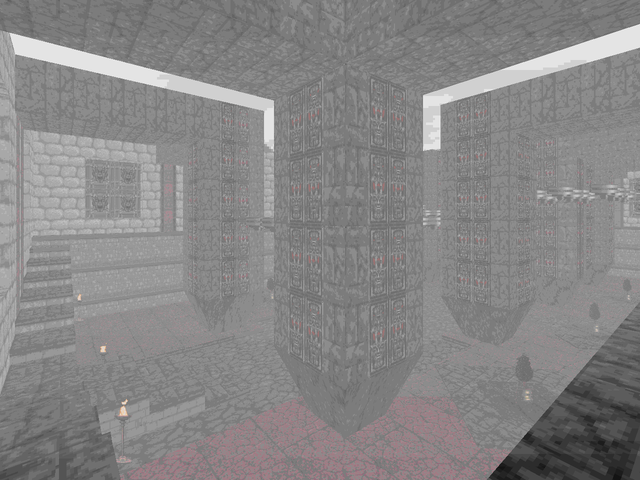 Another large level, this one imitating ROTT's mist-obscured maps. Combat is fairly typical with a few major exceptions. I like the firewall trap, which lets you use your new toy straightaway in an optimized environment. There are also a few places where stupid guards walk into the blades of death, always fun. Last, the end fight is a gauntlet through three Triad Enforcers. SAVE YOUR ROCKETS. 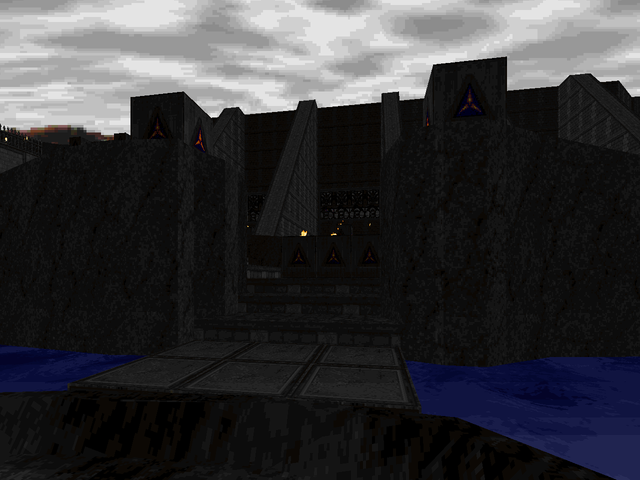 The more distinguishing bits use platforming elements, like the jump pad towers in the northeast or the creeping bridge across lava to the southwest. And the use of walls to push guards out over that long descending staircase is a nice touch. This particular outing has a heavy pyramid flavor, using the salmon-colored stone blocks quite prominently. I love the giant Triad motifs found throughout. Another nice element is that water portal. Nothing really new here except the debut of the magical weapons from Dark War. Both staffs are easy finds but the Excalibat involves a switchplate puzzle that I got purely by accident. If there's a clue to the solution, I didn't see it when I strolled through the map. 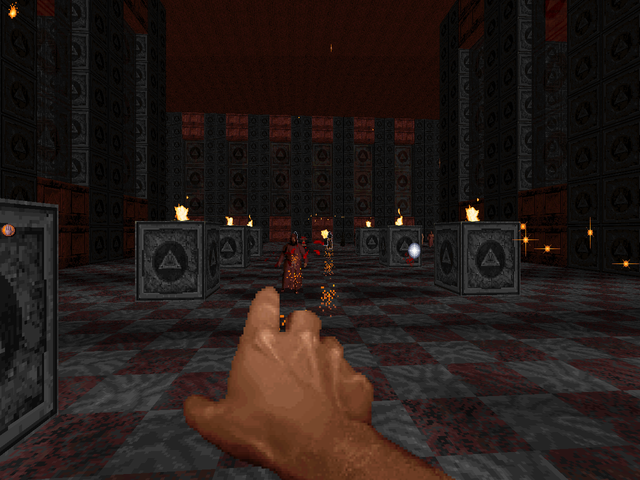 None of the combat really sticks out to me except for an Enforcer lodged in a parapet (a little tricky to deal with) and that flamethrower maze to the west, where I believe the fire shoots faster as you pull levers. It's a citadel! But it's a lot more than a citadel. Difficulty really steps it up here with a host of both kinds of monks (though mostly the Death ones) as well as some really hairy fights. 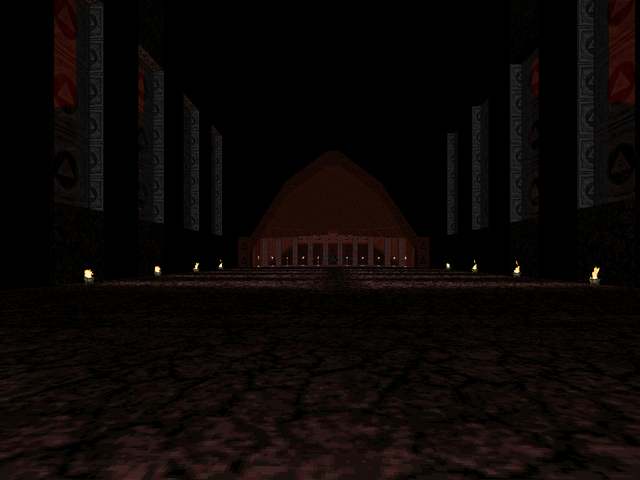 The final leg of the fortress is the most challenging, combat-wise (not to mention the actual exit). There are enemies on several tiers firing at you, so you'll have to watch out for monks near and afar on top of the ordinary trash. Then there's the final fight, squaring off against four Enforcers in a surrounding pattern. Also some really cool secret moments. In that same area, you'll find a jump pad that bounces you into a secret hidden in the ceiling. Very fun and the detailing is quite nice; I love the way slopes are used. I hope you like monks! And I hope you brought some explosives with you from the previous level. 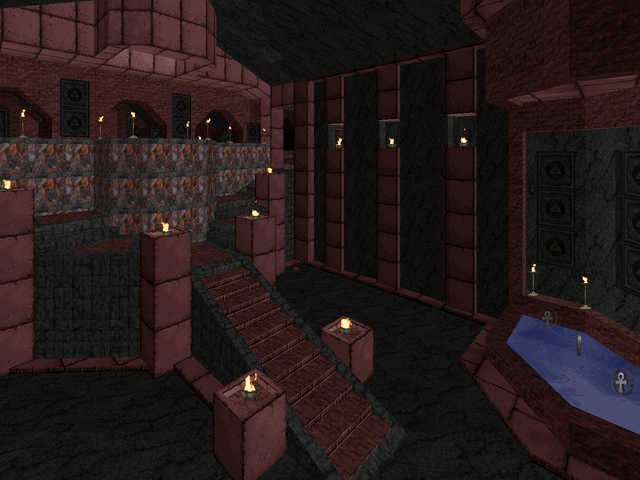 This gorgeous, lava-inundated monastery is pretty short compared to previous maps, but it's got a high HP count. Of course, knowing all the secrets will help. A lot. Seriously, you can get a lot of mileage out of that Excalibat and God Mode. These free for all Monk fights are pretty engaging and I was surprised by the Death Monks in the northeastern arena. The southwestern leg is pretty cool too, knocking out a ton of dudes and then picking off the pillar monks with the handy dandy staff. I wish El Zee had left just a few more explosives lying around. Hehe. Well, it's a huge series of catacombs, no doubt about that. They look great, loaded with tons of sarcophagi and pretty much all high-tier enemies. Mostly monks, but there are some overpatrol guys to ruin your day along with some enforcers (and special guests!). The large mausoleum area is one of my favorites as you don't quite know where the fire monks are at first and when you focus in on them the other guys kind of sneak up on you. My other favorite is the Excalibat puzzle, set in a darkened room where stepping into the wrong area teleports you back to the beginning. There's a trick, though, that's easy to catch on to and which makes the whole thing very easy. If you don't notice it, though, you may be a while. Basically a boss map. Starts out with a grind against a ton of enforcers before you get to grab a God mode powerup and go to town on a convent's worth of monks. I'm not sure what I was expecting for a final fight... Certainly not robot clones of the H.U.N.T. Team, who are INCREDIBLY LETHAL. Seriously, prepare to die. They're incredibly fast and have access to most of your weapons, most importantly the firewall. Don't be afraid to retreat; that's why they gave you that huge stockpile of monk crystals at the beginning. change ¬¬ I need at least the changemap console command. Please. Hello, where would a working link to this TC be located? I Can't find one on this page, thanks in advance! BTW i love your reviews, i've been following this blog for quite some time, you have found some great maps i would otherwise never have found! btw, I have found some good new 2013 and 2014 wad releases on ID games, hopefully to see them reviewed soon. Whoops! It looks like El Zee restructured his site in the two years since I posted the review. The link has been fixed. As for requests, I'm working through them at my leisure :P I'll keep an eye out, though I should mention that neither of the PWADs you've mentioned were released in 2013 and 2014. I'd like to see more of this, Rise of the Triad with the Doom engine could have been a potentially awesome game and it's a bit less repetitive. 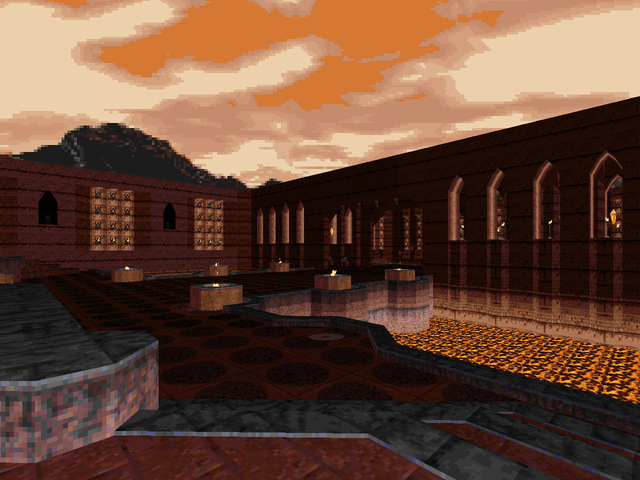 I'm even wishing at least one of the two secret levels had been upgraded to take advantage of the Doom engine's allowances, rather than being a 100% faithful conversion.